Hyperbole is a form of expression we commonly use in our communication with each other and it was also commonly used by the authors of Scriptures. Because this form of expression is sometimes not recognized for what it is, interpreters of Scripture have drawn conclusions as to what the Scriptures are saying that simply are not valid. This is especially true relative to the prophetic Scripture. Hyperbole is rhetorical exaggeration. It is the use of language to overstate something and make things appear to be over and above what they really are. It is rhetorical embellishment. It is from a Greek word meaning “excess.” Hyperbole involves figures of speech in which exaggeration is used for emphasis. Back in the 1960’s, when I was still in college, I came across a booklet written by author Herbert W Armstrong entitled “The Proof of the Bible.” In this booklet Mr. Armstrong discussed the fulfillment of various OT prophecies including a prophecy against Tyre where the prophet Ezekiel said Tyre would be completely destroyed and never be rebuilt. Mr. Armstrong put out the challenge that if anyone could rebuild Tyre they could disprove the Bible. At the time I was rather impressed with what I read. However, a few years later I read an article in a religious magazine explaining how Tyre had been rebuilt many times. The author of this article attempted to explain Ezekiel’s prophecy by saying it was still in the process of being fulfilled. My interest was peaked and my curiosity led me to the Public Library where I found an old book on the history of Tyre which showed how it has never been completely destroyed and is a viable city to this very day. This discovery caused me to question the reliability of the Scriptures. It appeared the prophet Ezekiel was a false prophet and if this was the case, how could I believe what other writers of Scripture were saying. It wasn’t until I came to recognize the element of hyperbole in Scripture that the issue became resolved for me. Isaiah 13:9-10: See, the day of the LORD is coming --a cruel day, with wrath and fierce anger-- to make the land desolate and destroy the sinners within it. The stars of heaven and their constellations will not show their light. The rising sun will be darkened and the moon will not give its light. Ezekiel 32:7-8: When I snuff you out, I will cover the heavens and darken their stars; I will cover the sun with a cloud, and the moon will not give its light. All the shining lights in the heavens I will darken over you; I will bring darkness over your land, declares the Sovereign LORD. Isaiah 34:4: All the stars of the heavens will be dissolved and the sky rolled up like a scroll; all the starry host will fall like withered leaves from the vine, like shriveled figs from the fig tree. Did the entire starry host actually dissolve? Was the sky actually rolled up like a scroll? Did all the starry host fall like withered leaves? Of course not. This is hyperbole. It is rhetorical exaggeration to get a point across. The point was that God would bring judgement upon Edom. You find this kind of language throughout the Scriptures not only in prophetic literature but in other contexts as well. This is why we must be careful when reading Scripture to identify hyperbole and separate it from objective reality. In Ezekiel 26, the prophet relates that the word of the Lord came onto him and what follows is a rather detailed prophecy against Tyre. Ezekiel 26: 1-6: In the eleventh year, on the first day of the month, the word of the LORD came to me: "Son of man, because Tyre has said of Jerusalem, `Aha! The gate to the nations is broken, and its doors have swung open to me; now that she lies in ruins I will prosper,' therefore this is what the Sovereign LORD says: I am against you, O Tyre, and I will bring many nations against you, like the sea casting up its waves. They will destroy the walls of Tyre and pull down her towers; I will scrape away her rubble and make her a bare rock. Out in the sea she will become a place to spread fishnets, for I have spoken, declares the Sovereign LORD. She will become plunder for the nations, and her settlements on the mainland will be ravaged by the sword. Then they will know that I am the LORD. Ezekiel 26:7-10 "For this is what the Sovereign LORD says: From the north I am going to bring against Tyre Nebuchadnezzar king of Babylon, king of kings, with horses and chariots, with horsemen and a great army. He will ravage your settlements on the mainland with the sword; he will set up siege works against you, build a ramp up to your walls and raise his shields against you. He will direct the blows of his battering rams against your walls and demolish your towers with his weapons. His horses will be so many that they will cover you with dust. Your walls will tremble at the noise of the war horses, wagons and chariots when he enters your gates as men enter a city whose walls have been broken through. Ezekiel 26: 11-14: The hoofs of his horses will trample all your streets; he will kill your people with the sword, and your strong pillars will fall to the ground. They will plunder your wealth and loot your merchandise; they will break down your walls and demolish your fine houses and throw your stones, timber and rubble into the sea. I will put an end to your noisy songs, and the music of your harps will be heard no more. I will make you a bare rock, and you will become a place to spread fishnets. You will never be rebuilt, for I the LORD have spoken, declares the Sovereign LORD. From verse 14 to the end of chapter 26, the prophet continues to predict the utter destruction of Tyre. The chapter concludes with the statement that Tyre will be brought to a horrible end and never again be found. The city of Tyre was located both on the mainland and as an island in the Mediterranean Sea. The mainland parts of the city were virtually suburbs of the island city. The island city was the main part of the city and was protected by huge walls and towers. It is clear from a total review of this prophecy that it is the nation of Tyre and the king of Tyre existing at the time this prophecy was uttered that is the focus of this prophecy. It is also clear from the secular history of this period and from the Bible itself that Tyre has never been completely destroyed or eliminated from the face of the earth. While it has been invaded and partially destroyed many times, it has always rebounded and it continues as a Mediterranean coastal city to this very day. Christian apologists who recognize this argue that the destruction of Tyre was to be carried out over centuries of time and that the city would not be completely destroyed until sometime yet in our future. It is pointed out that Alexander the Great invaded Tyre in 332 B.C. and was able to build a causeway to the island city and successfully batter down its walls. However, history shows Alexander never totally destroyed the city and it was rebuilt. There were subsequent invasions by the Romans, Arabs, Crusaders and others running clearly into the fourteenth century A.D. and beyond. The argument that the fulfillment of this prophecy is an ongoing process is based upon the statement in Ezekiel that, “I will bring many nations against you, like the sea casting up its waves” (Ezekiel 26:3). It is argued that because in verse twelve there is a shift from using the word “he,” referring to Nebuchadnezzar, to the word “they,” the “they” is referring to other invaders who would come after Nebuchadnezzar, invaders such as Alexander the Great and others. It must be pointed out, however, that in ancient times and even in more modern times, nations are made up of various conquered territories where the inhabitants of such territories become the fighting forces for such nations. A look at the history of Babylon shows this to be the case as well. Therefore, you could just as easily argue it was nations under the command of Nebuchadnezzar that came up against Tyre and not nations down through history. The key to understanding the time frame for this prophecy and its fulfillment is to simply consider the context of this prophecy. In Ezekiel 26:2-3, the prophet gives the reason for judgement to come against Tyre. “Because Tyre has said of Jerusalem, ‘Aha! The gate to the nations is broken, and its doors have swung open to me; now that she lies in ruins I will prosper,’ therefore this is what the sovereign Lord says: I am against you, O Tyre.” What follows is God speaking in the first person, describing what would become of Tyre and concluding with these words: “Then they will know that I am the Lord.” It should be apparent that the “they” being referred too are the Tyrinians who are being punished for having designs on Jerusalem. The context clearly shows that it is because of the attitude of Tyre toward Jerusalem at the time this prophecy was written that the city was going to be destroyed. This attitude was not being exhibited centuries into the future necessitating a continuing judgement against Tyre. God said that as a result of this destruction “they will know that I am the Lord.” Tyrinians living during the time Alexander the Great invaded Tyre certainly would not think they were being invaded because of the Tyrinians attitude toward Jerusalem hundreds of years earlier and therefore they would come to know the LORD. Tyrinians living hundreds of years after Alexander would have no idea they were being invaded because of an attitude toward Jerusalem which would result in them coming to “know the Lord.” To punish Tyrinians living hundreds and even thousands of years into the future for an attitude exhibited by Tyrinians living at the time of Ezekiel would place in question the administration of justice in this matter. Furthermore, in the entire 27th chapter of Ezekiel, the prophet lists the various nations that traded with Tyre and how these nations would lament over the destruction of this city. By simply reading through this material, it becomes obvious that the nations spoken of, and the kind of trading that was going on, related to nations existing at the time of Ezekiel and are not nations existing hundreds and thousands of years into the future that would be lamenting the destruction of Tyre. Therefore, to postulate that this prophecy has to do with an ongoing fulfillment over thousands of years just does not fit the context of the prophecy. What then are we to make of this prophecy? The context shows that the events of this prophecy apply to the Tyrinians living at the time this prophecy was written. Yet, it is obvious from both secular and Biblical history that Nebuchadnezzar did not accomplish a great deal against Tyre. He did not destroy Tyre. Articles in the 1978 edition of The New Encyclopedia Britannica and the 1984 edition of The Encyclopedia Americana both show that Tyre successfully withstood a 13 year siege from the King of Babylon. The historical record shows that while Nebuchadnezzar did destroy the mainland suburbs of the city, the main part of the city, which was the island city, withstood a 13 year siege and the Babylonians never did conquer the city. The Scriptures themselves bare this out. In Ezekiel 29:18-19, it’s recorded that because Nebuchadnezzar and his army did not receive wages from the siege of Tyre, God would now give the spoil of Egypt to him as wages. Ezekiel 29:18-19: Son of man, Nebuchadnezzar king of Babylon drove his army in a hard campaign against Tyre; every head was rubbed bare and every shoulder made raw. Yet he and his army got no reward from the campaign he led against Tyre. Therefore this is what the Sovereign LORD says: I am going to give Egypt to Nebuchadnezzar king of Babylon, and he will carry off its wealth. He will loot and plunder the land as pay for his army. Thus the Biblical record itself indicates the Babylonians had limited success against Tyre. Yet the prophecy against Tyre, that directly relates to the role that Nebuchadnezzar would play, suggests a much greater success than is later attested to in Scripture and in secular history. Isaiah 23:15-18: At that time Tyre will be forgotten for seventy years, the span of a king's life. But at the end of these seventy years, it will happen to Tyre as in the song of the prostitute: "Take up a harp, walk through the city, O prostitute forgotten; play the harp well, sing many a song, so that you will be remembered." At the end of seventy years, the LORD will deal with Tyre. She will return to her hire as a prostitute and will ply her trade with all the kingdoms on the face of the earth. Yet her profit and her earnings will be set apart for the LORD; they will not be stored up or hoarded. Her profits will go to those who live before the LORD, for abundant food and fine clothes. Christian apologists point out that the present city of Tyre is not on the exact location where ancient Tyre stood, nor is it anything near the great city it once was. Some have reported that fisherman have been known to spread their nets on some of the rocks of the ancient city as the prophecy suggests. The fact remains, however, that the fall of Tyre and assertions that it would not be rebuilt fall far short of the pronouncements made by Ezekiel. The Interpreter's Dictionary of the Bible (Vol. 4, p. 721) has an aerial photograph of modern Tyre, which shows the former island part of the city covered by a town. What the photograph shows agrees with Harper's Bible Dictionary, which speaks of a deep sounding done in the 1970s that showed the city has been continuously occupied from the time of Nebuchadnezzar to the present (1985, pp. 1101-1102). So what should we conclude about this matter? Both the mainland and island parts of the city of Tyre were attacked, invaded and suffered a measure of destruction by the Babylonians. It is true the city has never regained its former glory. To that extent, this prophecy has been fulfilled. Did Tyre come to a horrible end and cease to exist, never to be rebuilt as Ezekiel prophesied? No it didn’t. Both secular and Biblical history shows Tyre survived and continues to survive to this very day. So is this a failed prophecy? Does the fact Tyre has been rebuilt many times and stands to this very day prove the Scriptures are unreliable? You can draw this conclusion only if you insist on taking this prophetic narrative literally in its entirety and fail to see its hyperbolic content. The historical reality is that Tyre was indeed attacked by the armies of Nebuchadnezzar. There was destruction to the city. Was there the kind of destruction as depicted in the prophecy? No there wasn’t. The prophesied judgement against Tyre is exaggerated and embellished beyond the actual facts involved. This could be looked upon in the same vain as the prophecy against Edom being fulfilled without the stars dissolving and the sky being rolled up as a scroll as implied in the prophecy. The Scriptures contain a great deal of hyperbole, especially in the area of eschatology. There are many writings where hyperbole is involved. Jesus uses hyperbole in the Olivet Discourse. In prophesying of a coming judgement, Jesus said: “the sun will be darkened, and the moon will not give its light; the stars will fall from the sky, and the heavenly bodies will be shaken.” This is the same kind of language seen in a prophecy against ancient Babylon. Isaiah 13:9-10, 13: See, the day of the LORD is coming --a cruel day, with wrath and fierce anger-- to make the land desolate and destroy the sinners within it. The stars of heaven and their constellations will not show their light. The rising sun will be darkened and the moon will not give its light. Verse 13: Therefore I will shake the heavens, and the earth shall remove out of her place, in the wrath of the Lord of hosts, and in the day of his fierce anger. That all this rhetoric by Isaiah is directed to ancient Babylon is seen at the beginning of this prophecy and is seen at the end. Isaiah 13:17-22: Behold, I will stir up the Medes against them, which shall not regard silver; and as for gold, they shall not delight in it. Their bows also shall dash the young men to pieces; and they shall have no pity on the fruit of the womb; their eye shall not spare children. And Babylon, the glory of kingdoms, the beauty of the Chaldees' excellency, shall be as when God overthrew Sodom and Gomorrah. Did this prophecy come to pass? Yes it did. Both secular history and the 5th chapter of Daniel show that the Medes invaded Babylon. Were the heavens literally shaken and was the earth literally moved out of its place? There is no record of such things happening. Isaiah said Babylon “will never be inhabited or lived in through all generations" (Verse 20). Modern day Iraq is the site of ancient Babylon. It is being lived in and has been lived in for many generations. 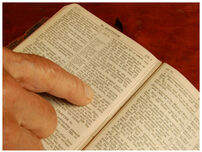 I have said several times during this series that we must be careful not to read the Scriptures too woodenly. What I mean by this is we must recognize that the writers of Scripture use a good deal of hyperbole, metaphor, analogy and figurative language in their writings. Our challenge is to identify such language for what it is and not apply such language in a literal manner which can lead to all sorts of distortions as to what the writer intended. We must recognize the methodologies used by the writers of Scripture. In so doing we will be better able to rightly divide the word as Apostle Paul instructed Timothy (2 Timothy 2:15 KJV).